There, I just did it. I typed in Korean. Typing in the target language is an invaluable ability for the language-learner. If you take a Spanish class, you have to turn in typed essays. For Spanish, it is not as big a problem if you don’t set your language into Spanish – all you have to deal with is an annoying squiggly line under every single word. But to type in a language that uses a completely different writing system, like Korean, Japanese, Russian, Chinese, etc., a computer has to be set to use multiple “keyboards”. Before you get excited and go add Korean to your computer’s “keyboards”, take a moment to look at your actual keyboard’s keys. They’re probably the alphabet used by English, Spanish, etc. Not Korean, not Japanese, not Russian. They’re also probably in QWERTY format. The Korean keyboard is NOT in QWERTY format because it does not have Q – it doesn’t have any of those letters, technically. It has hangul, and your QWERTY is actually ㅂㅈㄷㄱㅅㅛ. Not the same. Unless you intend to learn through very aggravating trial-and-error, I recommend that you order keyboard stickers. They’re cheap and well worth the money. I use black background stickers with white-symbol QWERTY format, yellow-symbol Japanese hiragana (ひらがな）, and blue-symbol Korean (한글) hangul. You can purchase clear, white, or black backed stickers, with either just English and Korean, just English and Japanese, or all three. If you also intend to learn Japanese, it really doesn’t matter if you get Japanese symbols as part of the set too, because that format is rarely used (more about that in a late post). The stickers are best applied with a pair of tweezers, they don’t take long to put on your keys, and they stick very well. I have never had any of them come off or even get a little bit loose. The total with shipping for one set is about $6. If you’re serious about learning Korean, this isn’t a bad price for learning to type. 2. Under Clock, Language, and Region, click on Change keyboards or other input methods. 3. Select the tab labeled Keyboards and Languages and click Change keyboards. 4. Under the General tab, to the right of the box with a diagram that says Keyboard, click the Add… button. 5. Scroll down to Korean, click its + sign, click the + sign for Keyboard, and then check the boxes for Korean and Microsoft IME. Make sure you click BOTH of those boxes and BOTH of them have checks. Now click OK.
6. Your box of keyboard languages should now include KO. Click Apply, and then click OK. NOTE: The rest of this is up to your personal preference, but this is how I have further customized. 7. Select the tab Language Bar and choose Docked in the taskbar. I have Show the language bar as transparent when inactive and Show text labels on the Language bar also checked. You should now have a language button on your taskbar. EN for English! 8. Want to switch between keyboards quicker? As I type in three keyboard formats, this is a nice customization. Select the tab Advanced Key Settings. Set a hot key pattern to use to switch to Korean and a pattern to switch to English. NOTE: The default typing system will remain in English no matter what keyboard you switch to. However, if you look at your taskbar, pressing these hot keys will alter the keyboard so you can toggle between Korean and English when using the Korean keyboard. This sounds confusing but once you start using it, it will make a lot more sense. Notice that though the keyboard is set to KO (Korean keyboard format), it will still type in English when you switch to it. See the A. A means that it types in English. 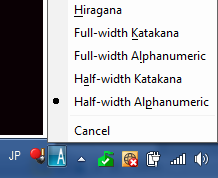 ….until the Input Mode ‘A’ is toggled to hiragana, katakana, etc. However, when you toggle the A by clicking on it, it switches immediately into hangul! See the 가? The Korean keyboard is will now type hangul! If you have questions or need a step clarified, please comment. 감사합니다! An extra muffin: Often, when you visit sites in other languages, your computer isn’t set to recognize characters from that language’s “keyboard” and it will show question marks or random symbols. It can’t process that HTML. When you add that language to your computer, however, it stops this from happening (most of the time).